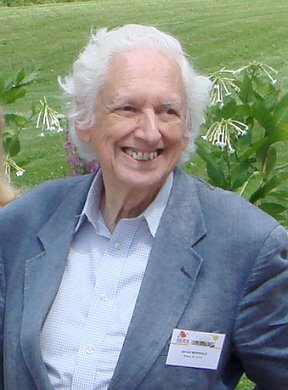 Jerrold (Jerry) Meinwald -- one of the founding fathers of chemical ecology -- died peacefully of cancer April 23, 2018 in Ithaca, NY, at the age of 91. Born in New York City on January 16, 1927, Jerry served in the US Navy as an electronics technician (1945-46), earned a Ph.B (1947) and B.S. (1948) in Chemistry at the University of Chicago and a M.A. (1950) and Ph.D. (1952) at Harvard. He started his career at Cornell first as a DuPont Postdoctoral Fellow and Instructor (1952-54) and then as Assistant Professor (54-58). Except for a brief hiatus when he joined the faculty at University of California-San Diego (1972-73), he remained at Cornell through his career. He was named Goldwin Smith Professor of Chemistry (1980-2005) and Goldwin Smith Emeritus Professor of Chemistry since 2006. He published his first paper in chemical ecology in 1954: the degradation of nepetalactone, JACS 76: 4571. Jerry produced more than 400 peer-reviewed articles with some 200 collaborators; his last publication was a review article just published in ACS Omega: Molecules as biotic messengers, DOI: 10.1021/acsomega.8b00268. Chemical ecology is a six-decade-old discipline, with two centuries-old roots in the research endeavors by Henri Fabre, Joseph Lintner, Ernst Sthal, and many others. Two events marked the emergence of this new field: Adolf Butenandt unraveled the chemistry of bombykol (1959) while Thomas (Tom) Eisner and Jerry Meinwald divulged at the 6th International Congress of Entomology in Vienna their research on "the defensive spray of a whipscorpion." The Tom & Jerry collaboration lasted for five decades until Tom passed away in 2011. On Jerry's advice, the New York Agricultural Experiment Station recruited Wendell Roelofs, and the State University of New York at Syracuse hired Robert (Milt) Silverstein, while Cornell recruited Paul Feeny. Upstate New York became the first center of excellence in chemical ecology. The new emerging field turned into an academic discipline when Cornell offered for the first time in the early 1960s a chemical ecology course that attracted hundreds of undergraduate students. Front and center were the elegant studies on insect chemical defenses by Tom and Jerry -- the founding fathers of chemical ecology. As chemical ecology matured, Jerry played another crucial role for the field -- the Ambassador-at-large for chemical ecology. With other colleagues, Meinwald spearheaded the creation of the International Centre of Insect Physiology and Ecology (ICIPE), Kenya, almost 50 years ago, and served as Founding Director. In the late 1990s, Meinwald played a crucial role in the founding of the Max Planck Institute for Chemical Ecology â€“ a vibrant force, a center of excellence in chemical ecology. As member of the Editorial Board of the Proceedings of the National Academy of Sciences (since 2007), Meinwald was a strong advocate for chemical ecology. The last paper he edited was published on April 9, 2018, https://doi.org/10.1073/pnas.1716852115. He was a member of the Editorial Board of the Journal of Chemical Ecology since 1974 and served as President of the International Society of Chemical Ecology (1988-89). Jerry's research has been nationally and internationally recognized. He was elected to the National Academy of Sciences (1969), American Academy of Arts and Sciences (1970, serving as secretary for a decade) and the American Philosophical Society (1987). He received ISCE's Silver Medal in 1991. Jerry received an honorary Ph.D. from the University of Goteborg (1989), the Tyler Prize in Environmental Achievement (1990), the Benjamin Franklin Medal in Chemistry (2013) and numerous awards. In 2014, President Obama presented Meinwald the 2012 National Medal of Science. Jerry's two greatest interests were chemistry and music. He performed chamber music at the ISCE meetings in Urbana, Illinois (2014), Stockholm, Sweden (2015), and Kyoto, Japan (2017).